I shaved off 8 minutes from last year’s debut – what’s not to like? But first, I endured the “sweet” sensation that is… thigh chafing. Yup. It was during my 2nd attempt to run in KL’s most colorful and biggest marathon event that I first experienced chafing. My chafe-free days are officially over. I usually wear knee-length tights when I run so I have always been protected from the vigorous running motion of inner thigh rubbing. You know the old runner’s adage of “don’t try new things on race day”? Well, I completely disregarded it in the shorts department. Cocky, I threw caution to the wind and ran in a pair of brand new Adidas running shorts I had purchased on a trip to Bandung. And boy did I sting afterward. I only realized the injury after I had gone home and showered. Somehow post-run at the scene, I was numb to the pain till I got home and exposed the affected area to warm water and soap suds. That sonic boom my neighbors heard and wondered about? Me. Yelping shrilly in the shower. 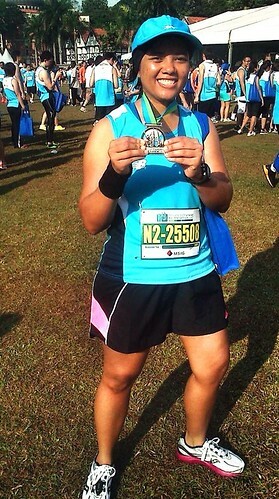 But intimate body sore stories aside, Standard Chartered KL Marathon was – as my good friend Mims likes to sum it up – ran like a tight ship. They did one major thing differently this year, particular for the 10k race, and that was wisely splitting the 15,000 registered runners into 3 manageable waves. The 10k run is always the most popular category, so letting loose that many people simultaneously will take a while to clear. The 3 different sub-categories of the 10k catered to runners who had different goal times and paces: Speed, Cruise and Leisure. The race had a cut-off time of 75, 90 and 120 minutes respectively, failing which will not earn you a finisher’s certificate with your time imprinted (you’ll still get a finisher’s medal if you complete it though). Since I felt confident I could run 10k under 90 minutes, I chose the middle category. So because the 10k runners were segregated this way, we were scheduled to flag off at different times, resulting in a more controlled flow of runners to the venue. I noticed this difference when I went to Kelana Jaya to board the LRT to the city center – there were not as many runners crowding the bus stop like last year. In fact the last free bus that left with runners this time had everyone seated and only a handful standing up. As we arrived at the station, the bus driver – who was getting ready to depart – slowed down to let us hop on, but we declined as we didn’t want to risk being late to the starting line due to traffic jam. It happened last year. However the trains didn’t start running till 6:20am (the station is supposed to start operating at 6am). The control freak in me was beginning to panic because I didn’t know what time we’d reach the start line (we were due to flag-off at 7:15am) and I was just ready to chew someone’s head off. As soon as the rolling doors at the station were raised, the crowd of runners that had built up poured in and started making mad dashes upstairs to get to the boarding platform. We didn’t have to wait long, the first train came about a minute later. Because it had rained earlier that morning, the air was cool and crisp – perfect running conditions for a country so humid and hot. As we’re walking up Jalan Parlimen a policeman on his motorcycle was hurriedly heading down our path, honking incessantly and waving madly for us to step aside, which we did – though startled and a little annoyed. Turned out he was one of the escorts to accompany the leading national 10k runner (an Indian fellow) all the way to the finish line which was approximately 1.5-2km away from where I was standing. These folks were finishing the 10k in under 40 minutes. We clapped and cheered as the elite runners raced past us. Then one or two lady runners started trailing after these fast guys in their bid to complete their speedy 10k. The rest of us mere mortals, particularly us girls, hooted and clapped even more loudly and with more ferocity for these fast tigresses. Hoo yeah, sisterhood support, y’all! Not too long after the elite runners had left, more speedsters for the 10k were streaming in and I saw a red head white guy who looked familiar to me: it was a French colleague of mine. “Stephane!” I yelled, fumbling for my camera phone to snap a photo of him in action (he was too fast for me, of course). His ears perked up and his eyes and head were wildly trying to locate the origin of who was calling out his name. Our eyes met for a brief moment and he gave out a panting “Hey!” before dashing off. Later on in the office, I found out that his official time didn’t get recorded by the tagging system when he clearly had done a sub-1 hour 10k, a gargantuan feat for most of us. How crummy is that. Soon it was time for me to start running. The emcee must have told us a million times to step on the start line panel so that the timing chip could be activated by the detector underneath. This year the timing chip is embedded behind the race bib (a B-tag), and not a tag that we had to loop around and tuck under our shoe laces like last year (a D-tag). This was an improvement because it meant you had to only worry about putting on one essential item and that is the bib. You forget to wear that and nada, no timed results for you. This year also gave runners the opportunity to do some live reporting of their start time, middle checkpoint and finishing time on two major social media networks (albeit unofficial but it’s pretty close to being official). All you had to do was link your Twitter or Facebook account with your bib number on the SCKLM website and the system would post them online automatically. This cool setup was so that family and friends following you online knew at which point you were in the course, and (maybe) make their way to the finish line to support and cheer you on. I thought this was a neat feature and made running more exciting and competitive. A few friends didn’t set it up because they were shy about sharing their results. Whatever. Have fun with it, guys! Back to my race. It was time to run! The air was amazing, I cannot forget how cool and windy it was in the beginning. If only all runs were like this, I could be pounding the pavement tirelessly for hours (I wish). The route is very much the same as last year’s so I won’t blab too much about it. I only remembered wanting to enjoy the scenery and the run, and not be so pressured to reach a certain timing. Oh heck who I was kidding, I made sure I didn’t run over 90 minutes! I didn’t see too many unusual scenes, except these: Indian fellows lining up on the sidewalks in Little India, holding out their camera phones and even tablets, taking photos and videos of us streaming by. During that time I pulled the brim of my cap a bit lower to conceal my face (hehe). And then later on, I noticed a runner who gingerly ran barefoot. He didn’t look very comfortable, landing mainly on the ball of his foot – his soles were grazing against tarmac and he clearly wasn’t enjoying it. Water stations were plenty along the 10k route, there were so many that I was getting water-logged and feeling like an over-hydrated camel. I was disappointed that no isotonic drinks were made available to us (I could’ve sworn we had some last year – are all 10k events ditching them now?). It made me wish I brought candy, which I had foolishly forgotten. Sure, I was doing “only” 10k, but if you’re running for over an hour and want a little bit of energy left for a strong and meaningful kick to the finish line, replenishing sugar in your body doesn’t hurt at all. Note to self to pin a packet of candy on me next time. I hit the halfway point of 5.5km at around 39 minutes into my gun time, which a dear non-runner friend Dee thought was fast (woman, please – but thank you). Here are the tweets of my start, split and finishing times that were posted automatically to my Twitter account by the SCKLM timing system, pretty neat! As I’m running on Jalan TAR to finish the last kilometer, I noticed many zany supporters on the sides, holding up hilarious sign boards that said things like “Run faster lah, my arms already tired!” and “Naked Cheerleader, 1km ahead.” I couldn’t help but chuckle, but at this time my head was overheating, so I took my cap off and held it in my hand as I worked towards finishing the run. Paparazzi photographers were bountiful at this stretch also but by this time you already look and feel so horrid that even the longest telezoom lense couldn’t get you to raise a hand to shield your face. The finishing line was up ahead and so I attempted a “kick” by picking up the pace to end the race on a strong note (my standard modus operandi). I had to do a bit of weaving because the finish line was getting a bit too crowded, so I ran on the side. I think because of this maneuver my finisher photo was not caught on camera by the official photography system (bummer!). So with a timing of 1 hour 20 minutes and 46 seconds I ended the 10.6k run (on MapMyRun it says 10.8km – shrug) – a personal best for me. I think. What was important to me was that I finished under the 90 minutes cut-off for my category, so I was a happy camper. Race goody bag pickup was smooth as usual, though this time they didn’t include a banana in the mix. Wished they did because I was starving! I milled around the runner’s camp and managed to catch Farisha and Mims who had both done the half-marathon distance and even achieved some personal bests (well done, girls!). Evster on the other hand was lamenting how she fell 1 minute behind her target completion time of 75 minutes (she finished her 10k in 76!). I also saw Michael in the distance, along with his wife and kids (who all ran that day in different categories) but I didn’t get to say hello as there were crazy crowds to weed through to get to them and I wasn’t willing to go body surfing against sweaty runners more than I had to. I left the venue and made my way back to Masjid Jamek station to grab a bite to eat (roti canai and iced Milo!) and head home, but not before witnessing an elderly man in a collapsed state on the road, being overlooked by a few runners who were trying to shield him from the scorching sun. I noticed that the old man had grazed his knee (it was bloody red) and he looked in pretty bad shape. I choked and teared up because I felt sorry for him, and honestly that could have been anyone of us, if we had pushed ourselves beyond what our bodies could handle. Some paramedic personnel managed to be on the scene just before I left the scene, so I sure hope he turned out OK. Thus we have come to the end of my SCKLM 2012 recap. All in all, it was a fun and memorable event which – like me – ran better than last year. This just goes to show that added experience makes one faster and wiser (OK let’s forget the part where I chafed)! I ran sockless for the first time in a race. Not that bad! I love my new Saucony Kinvara 2s! @runfairyrun Good night! And congrats on the weekend's race! Way to go!! New Pink shorts and new Kinvara2 do make you look good ! glad you have fun.. whens your next race ? Alahai… sapa lah yang goreng ikan masin pagi2 buta tu ye? But in way good jugak because it made you speed up! Thanks Lina! Yes, the ikan masin frying was a nice touch, hehe. Ran like ayam kena hujan ok.